Plant Early: Refer to your planting calendar each month to see when varieties of fruits, vegies and herbs are coming into season or phasing out. Try to plant at the beginning of the season rather than late because weather can change and you risk not being able to harvest late sown varieties. 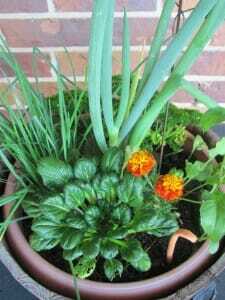 For example, I’ve learned to plant winter vegies just before winter as the weather cools down because in my sub-tropical climate, an early onset of spring is not uncommon. With the warmer weather, pests start to wake up and get active before I get to harvest the best of my crop! Plan to have your garden bed ready early in the season to take full advantage of the optimum growing conditions. Shop Smart: If you are buying seedlings from a retail outlet, nursery or grower, they will most likely be selling the vegies and herbs that are suitable for planting in the current season, however, this is not always the case! 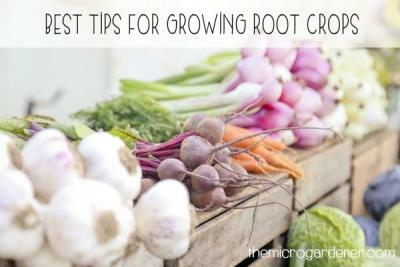 I’ve seen growers at markets and seedlings on shelves that are too early or late to plant and would be a waste of money to buy. Most likely they were leftover stock or a grower wanting to get a head start on the next season with some early sales. Either way, I don’t like handing money over to greedy merchants and I’m sure you won’t either! So get savvy by using your plant calendar before shopping for seeds or seedlings and write out your shopping list from your guide rather than relying on retailers to do the right thing by you. 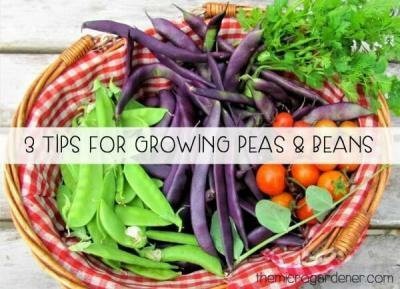 That way, if you have a list of winter vegies when you go out to buy, and see some warm season seedlings still for sale, you’ll wisely be able to steer clear and spend your money on what will grow in cooler weather. Get to know your local nursery, garden centre or grower and find out what days fresh stock arrives so you can get the pick of the crop! Share with a Friend: If you are buying seedlings in a punnet, they often come in 6 or 8 cells with the same plant variety. If that’s too many, swap and share with a friend or neighbour to get the quantity you really need. One way to do this is to each buy a punnet and use a paddlepop stick to gently ease out half the seedlings and exchange! Seedling punnets are an economical way of buying small quantities – use a paddlepop stick to lever out seedlings without damaging them to swap with a friend. Know Your Grower: My mantra is to ‘sow little and often’ – which in practice means every week or two I’m putting in some new seedlings so we have an abundant edible feast all year round. If I am not raising my own seedlings, sometimes I’ll buy from a local grower. If I don’t need 8 lettuce seedlings, I ask the grower to make up the punnets with my choice of other vegies so I don’t buy too much of one variety. 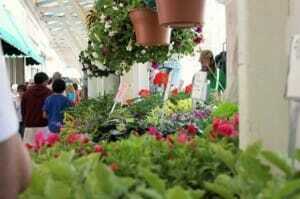 If you can, shop locally and meet the farmer who grows your seedlings or plants if you don’t raise your own. As a regular customer, you will often get exactly what you want if you develop a personal relationship with them – something you can’t do if you just buy off the shelf at a nursery! Going direct to your local grower will be cheaper than buying retail and you have the opportunity to learn from them when you are face-to-face. 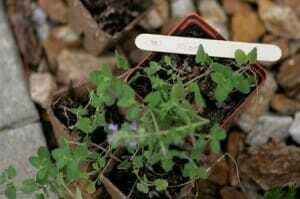 Read Plant Labels: Plant labels contain key information about the ideal conditions required to achieve best results. 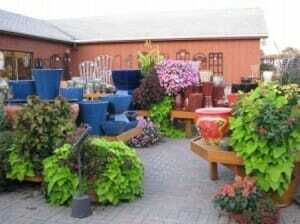 Pay attention to the mature size of the plant and make sure your garden space is suitable. This will also help avoid overcrowding. If you are looking to buy a fruit tree, check the label for pollination information – some species require a pollinating companion in order to produce a crop. So you will have to budget for 2 plants instead of 1! A cheaper alternative is to source self-fertile species that produce fruit on their own. Labels provide you with important information about the plant – pay attention to mature height, sun & water required, whether the plant is self-fertile and ideal growing conditions. Nurture Seedlings: Baby plants in punnets are divided into compartments or cells. 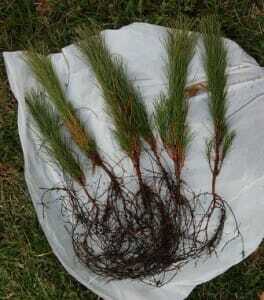 These plants have very small root systems and can dry out very quickly. 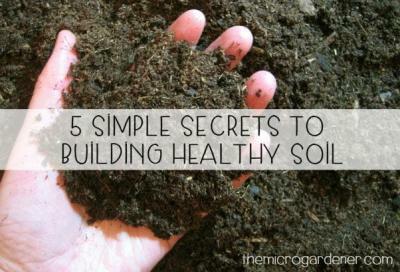 They are a convenient option if you haven’t the time or resources to sow your own seeds. If you are not planning to plant them out straight away, give them some extra care. Keep them cool, moist and out of hot drying winds and preferably in a protected position close to the house where you can keep an eye on them. I sometimes create a seedling nursery in a micro garden – a polystyrene box with homemade potting mix where I keep nurturing them until they are more established and ready for transplanting. Baby plants need extra care – if you are raising your own, make sure you harden them off gradually in filtered sun over a few days before planting them in full sun. Bare Roots: A money saving way to buy fruit trees, deciduous trees, shrubs, bushes, roses and hedging plants is to buy bare rooted stock. These are dormant plants with ‘bare roots’ or no soil that are generally sold in the cooler seasons like autumn and winter by some specialist nurseries and online. The roots should not be allowed to dry out – you can use a damp cloth or newspaper to transport them if you are buying face-to-face. 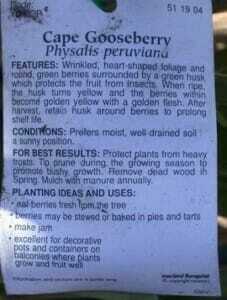 Ideally, they should be planted out within 3 days of buying or receiving them in the mail. If you can’t do this, then you can ‘heel them in’ by digging a trench that is slightly deeper on one side. Lay the plant in the trench so the sloping side supports it and then refill with well moistened compost/soil to cover the roots. Mulch well especially in the cooler months to regulate the soil temperature. 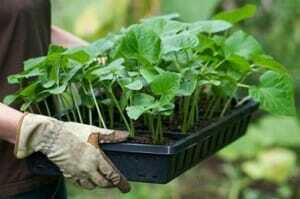 This temporary method of planting will work well for several weeks or months till you are ready to plant out. Bare rooted fruit trees and other kinds of shrubs and trees are an economical way to purchase plants in cooler seasons. 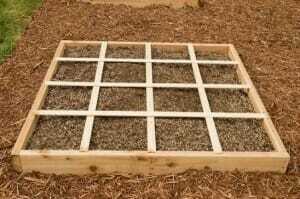 Warm up Seeds: If you are saving money by sowing your own seeds and want to speed up germination, bring your seed trays or pots indoors. Place them on a piece of wood and then on top of a warm place like a hot water system, clothes drier or wood heater. The extra warmth will kick the germination process along. 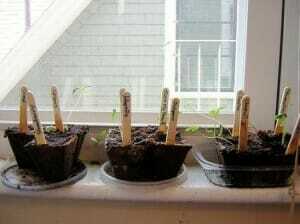 Raising seeds on a sunny windowsill is one good spot to help them germinate more quickly. 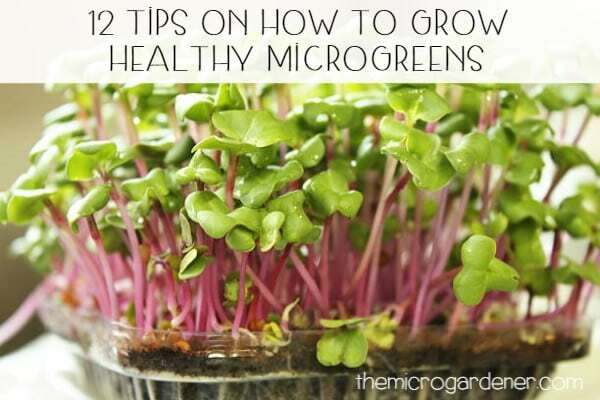 Want more garden tips? 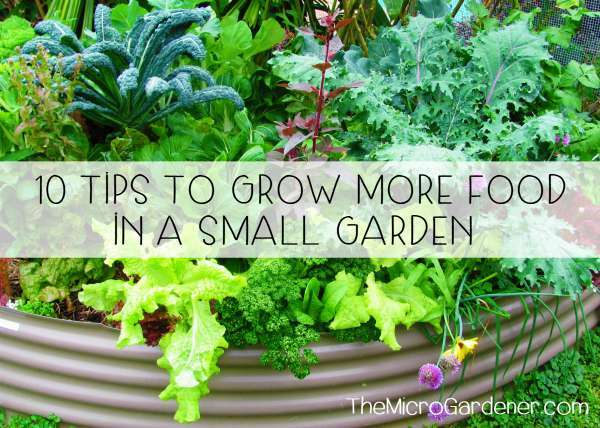 You’ll find more in Tips & Tricks and other simple money saving ideas in Frugal Gardening. Do you have a tip to share? Feel free to leave a comment below. Keep up to date with new posts by subscribing to my newsletter (and grab your free eBook) or click on the RSS feed below or to the right. I have a limited amount of space in my back yard for planting, however, I love the idea of fill all of the available space with plants. That is a great idea to share seeds with friends and family to get the biggest variety that you can. That is also a good idea to shop at local stores and get to know fellow gardeners so that if any questions arise you will know who to call for help. I am excited to start my little garden and see how it livens up my back yard.